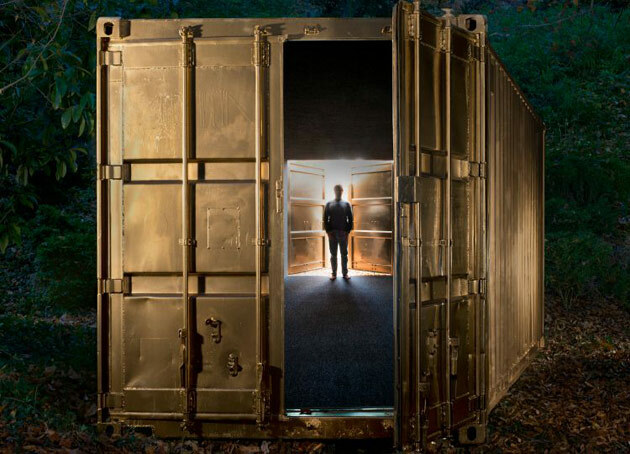 The Vanderbilt Portal to Mexico City, consisting of a custom-designed gold shipping container with immersive audio and video technology, will offer the entire Nashville community, starting Sept. 18, an opportunity to converse face to face with new acquaintances in Mexico’s capital city. Interested individuals must sign up in advance to reserve a time for a 20-minute conversation in the portal, or shipping container, which will be located on the South Lawn of The Commons Center. When you enter the portal, you will meet someone standing in another shipping container located in Mexico City. Translation will be provided if needed. “Portals,” a public art initiative offered in collaboration with Shared_Studios arts collective, will also provide educational programming for the Vanderbilt community related to artistic, academic and professional endeavors. Those interested in arranging special programs should email their request. The portal will remain at Vanderbilt through Oct. 12. The founder of Shared_Studios is Amar C. Bakshi, a former journalist who worked at The Washington Post and CNN and is a graduate of Yale Law School. He and a team of artists, designers, engineers, technologists and digital explorers at Shared_Studios launched the project in December 2014. Vanderbilt is only the third higher education institution to have a Shared_Studios portal on its campus. The Vanderbilt Portal to Mexico City has been brought to campus by The Martha Rivers Ingram Commons, Center for Latin American Studies, Curb Center for Art, Enterprise and Public Policy, Vanderbilt Fine Arts Gallery, Blair School of Music, International Legal Studies Program at Vanderbilt Law School, Department of Art, Department of History of Art and Political Science Department.